Autumn has arrived and Thanksgiving is only a few weeks away. If you are hosting your family dinner or taking a dish to another home, today’s recipe is the perfect side dish and one that will win you rave reviews. While it may not be a combination of ingredients that you normally would think to put together, they blend beautifully. This article is part of the Food Network’s Fall Fest, a celebration of vegetables that are in season and fresh at your farmer’s market or grocery store. Today we are celebrating carrots, the root vegetable that is sometimes the scourge of childhood but becomes a delight as you grow older. I love the natural sweetness of carrots and often look for ways to highlight it. If you have been looking for a slightly sweet holiday side dish that isn’t as cloying as sweet potatoes with marshmallows, something a little more “adult” and healthier, this is the one for you. If you want to kick it up a little more (especially if you are not having any children at your dinner), try substituting 1 to 2 tbsp of bourbon for part of the orange juice. I also think a little grated fresh ginger would be lovely and add just a hint of heat while not taking away from the delicate sweetness. I have loved the combination of carrots, dill and maple syrup for years. You can use any type of maple syrup you like, but I strongly suggest avoid “pancake syrups.” They are full of fake flavors that are far too strong and will overpower the delicate carrots and apples. I recommend you get 100% pure Grade A. Growing up I thought maple syrup only came from Vermont (they do make wonderful syrup there) but when I visited Columbus, Ohio, I discovered that it can be made anywhere that maple trees grow. Who knew? I am now officially hooked on the “real” thing and can’t imagine going back to pancake syrup again! I used orange juice and maple syrup in this recipe, which is a really nice combination of sweet and sour. If you are using freshly squeezed orange juice, you might want to increase the maple syrup slightly. Conversely, if you are using prepared orange juice, you can lower the amount of maple syrup to compensate for the added sugar. The only challenge with this recipe is figuring out how to cook two such different ingredients, carrots and apples, and have them both turn out perfectly. The trick is to start cooking the carrots and onions first, because they are denser and take longer, and then add the apples and finishing the baking so that everything comes out at the right texture. Another trick is to make sure all the carrots are about the same size so they cook evenly and to cut the onions and apples slightly larger. If you like your vegetables more on the crisp side, reduce the time the carrots and onions cook before adding the apples. Make sure you check out the incredible recipes listed below from the other bloggers also participating in Fall Fest. If you want to share the fun with your friends on Twitter, use #FallFest. Swing over to the Pinterest page to see the entire collection of recipes and photos. This dish is a nice change of pace and could become a new family Thanksgiving favorite. While The Artist and I shared a half recipe of these carrots and apples last night for dinner along with a beautiful green salad, I easily could have eaten the entire batch. I am certain that it will be making a repeat appearance at this year’s Thanksgiving dinner! For an easier option, use your food processor to slice the carrots and onions. (Cut the carrots into pieces short enough to stand up in feed tube.) Toss them into the prepared pans, making sure they are mixed. Bake for 15 minutes. Add the apple wedges and toss together. Drizzle with maple syrup and bake for another 15 minutes or until everything is medium firmness. Check by sticking a fork into several areas. Naturally gluten-free, but always check the labels for ingredients. Preheat the oven to 350°F. Pour oil into a small bowl and lightly brush two shallow au gratin dishes with about 1 tsp of the olive oil each. Prepare the Vegetables: Cut the carrots crosswise, dividing it by thickness of carrot, about 2/3 of the thicker end and 1/3 of the thinner end. Take the thicker ends and cut in half lengthwise, then each half into thirds. For the narrow ends, cut in half lengthwise and if needed each half in half again. You will wind up with 6 pieces from the thick top end and 2 to 4 pieces from the tapering end, each about the same thickness. NOTE: If you are using baby carrots, which are very tender, reduce the cooking time to compensate. Cut the onion in half lengthwise. With a very sharp knife, slice lengthwise into thin wedges. Evenly divide the carrots between the two oiled au gratin dishes. Tuck the onion wedges in between the carrots, distributing them evenly between the two dishes. Add the orange juice to the dishes, brush with the remaining oil, sprinkle with dill, and season with salt and pepper. Place, uncovered, in the hot oven. Bake for 20 minutes, 30 if you are using gigantic carrots. Prepare the Apples: While the carrots and onions are baking, cut the apples. The fastest way to cut apples is to take a thin slice off the bottom so that they sit flat. Then make two cuts, on either side of the center core (which is about 3/4-inch thick). Spin the apple and slice off the two remaining thin sections on either side of the core. Lay the apple pieces, flat side down, and slice vertically into thin wedges. Remove the pans from the oven and carefully add the apples, again interspersing them with the vegetables in both dishes. Drizzle with the maple syrup. Return to the oven and continue baking for an additional 20 to 30 minutes or until golden brown and slightly crispy at the edges. Adjust seasoning if desired with more salt and pepper. To Serve: Plate the fruit and vegetables and drizzle with a little of the pan juices. Drizzle with a little more of the dill if desired. Make Ahead: If you want to prepare this ahead, cook carrots and onions as directed. Add the apples and bake for 10 minutes. Remove from the oven, let cool, cover and refrigerate up to overnight. To reheat, place in oven and bake for about 15 to 20 minutes to warm through and finish baking apples. Check out all the other recipes in this week’s Fall Fest! I am so glad you enjoyed this combination – It is one of my favorites. 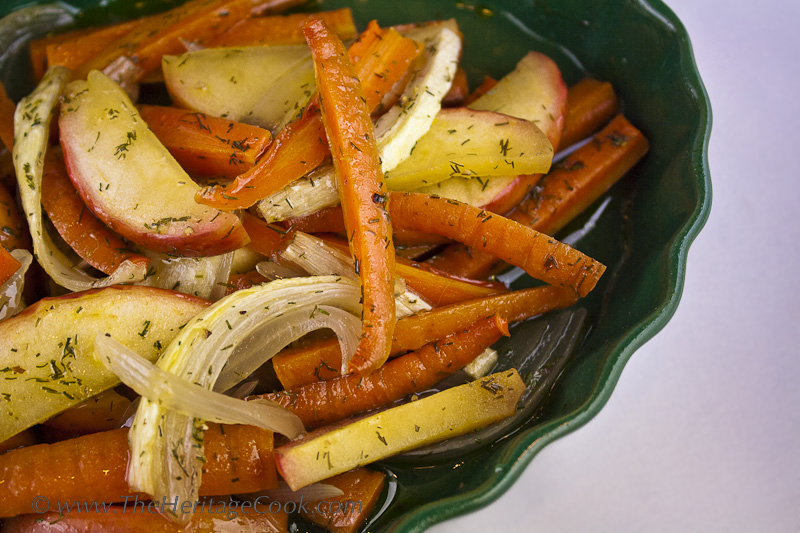 The sweetness of the caramelized onions and carrots blends beautifully with the apples. Enjoy!! Great minds think alike Liz 😉 Thanks for the compliment, I love your recipe too!